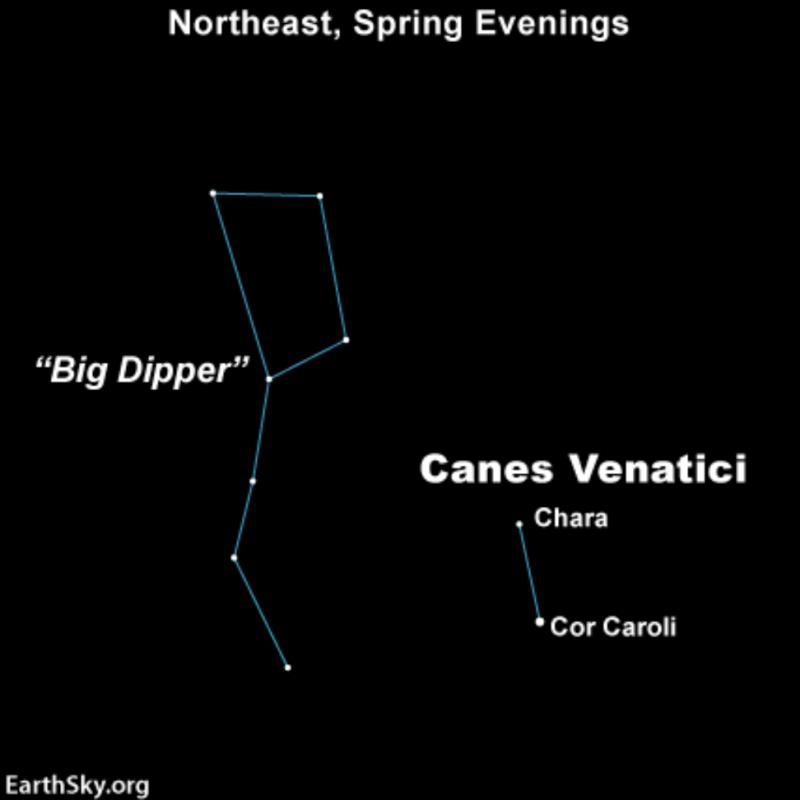 Look for the tiny constellation Canes Venatici the Hunting Dogs – and its brightest star Cor Caroli – behind the handle of the Big Dipper. 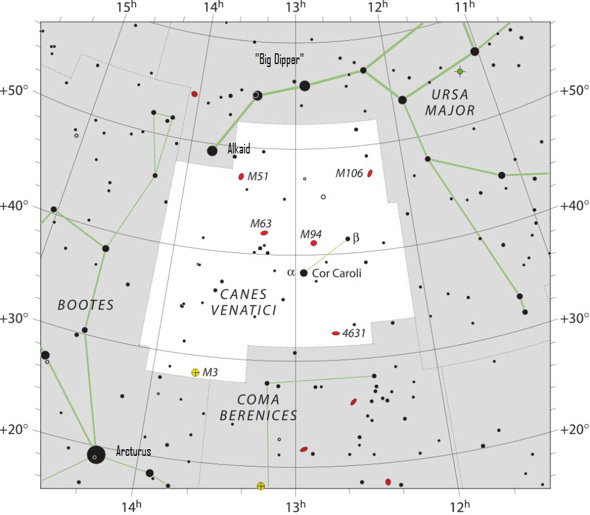 Cor Caroli is the brightest star in the constellation Canes Venatici the Hunting Dogs. As such, this star is also called Alpha Canum Venaticorum. This star and Chara, Canes Venatici’s second brightest star, are probably the only two stars you’ll ever come to know within the boundaries of this tiny constellation. 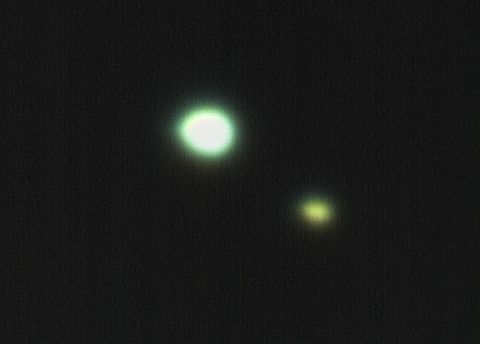 Though not bright, Cor Caroli and Chara are fairly easy to see in a dark country sky. That’s because of their relationship to the famous Big Dipper asterism, which is ascending in the northeast on spring evenings. The two stars of Canes Venatici parallel the two end stars in the handle of the Dipper. Cor Caroli means Heart of Charles. Some say the star was named to honor King Charles I of England, who was beheaded in 1649 during the English Civil War. These sources claim Cor Caroli was labeled on old star charts as Cor Caroli Regis Martyris, or Heart of Charles the Martyr King. Not everyone agrees, however. Others say the star was named for Charles I’s son, Charles II. Sir Charles Scarborough, physician to Charles II, is sometimes given credit for having coined the name. It’s said Scarborough claimed the star shone with exceptional brilliance on the night of Charles II’s return to England in 1660 to restore the monarchy. 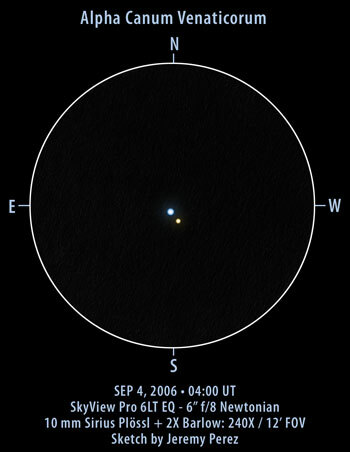 A small telescope reveals Cor Caroli to be a double star. So it’s easy to imagine father and son peacefully reunited in the heavens, after all their tumultuous years on Earth. Cor Caroli doesn’t just appear double. It’s a true binary star, consisting of two stars revolving around a common center of mass. The pair lies some 110 light-years away, and its two components are estimated to be 650 times the sun/Earth distance apart. One orbital period period may take as long as 7,900 years. This beautiful drawing is by Jeremy Perez. 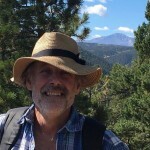 See more of his astronomical drawings at his website Belt of Venus. If you’re familiar with the constellation Leo the Lion, you can star-hop to Cor Caroli by drawing an imaginary line from the star Alkaid of the Big Dipper to the Leo star Denebola. Click here for details. This image is via Wikimedia Commons. Bottom line: The star Cor Caroli, or Alpha Canum Venaticorum, is a binary star and the brightest star in the northern constellation Canes Venatici the Hunting Dogs.